Here is how I am moving to a Zero Waste Lifestyle. The world has been going through some phases. We started with eco-friendly products and then moved onto polluting the earth so much that drastic changes took place. Now we are slowly evolving and learning what is actually harming our planet and moving onto using products that are safe for both our families and mother earth. 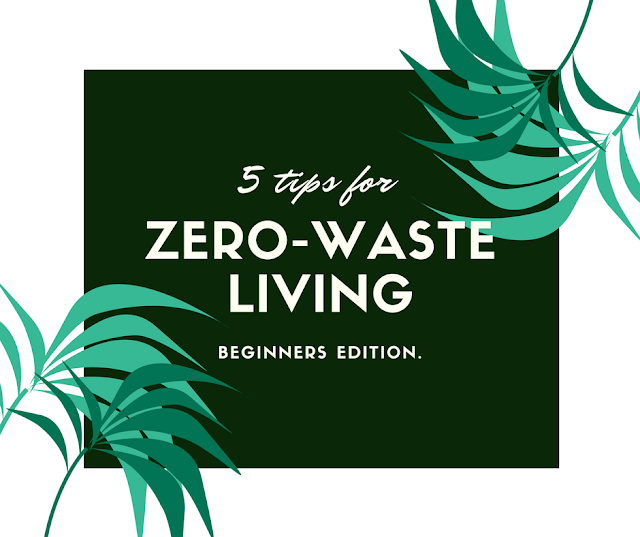 You don't have to be a pro at zero waste living. You can start small and make the smallest changes in your life. Even something as small as refusing to buy plastic bottled water is as big as taking a step to remove plastic from the mouth of one living creature. Now I know that zero waste is something that is close to impossible but it definitely is something that is achievable. By zero waste, I don't mean that you completely stop creating waste all of a sudden. All changes come through slowly and gradually. For starters, you can start using reusable shopping bags. The amount of plastic bags that are thrown in the trash and that create such a mess in the ocean is absolutely crazy! Millions of sea life have to suffer because we cant take care of our own waste. My favourite one has to be this Amazon Juco bag from Crazy bags! You can carry these bags anywhere with you and fill them in with your items while doing grocery runs. And you will definitely save a bit of money as well. Instead of paying 5 pence per bag, you are using your own. This is a very debatable topic but if you could see the amount of waste that is created by using wipes and other chemical products, you will instantly change your mind. I was the kind of person who used wipes in every single thing! And one day, while cleaning my house massively, I saw the number of wipes I had thrown out and it just made me feel so guilty for contributing to the state of our planet. I ran out and got some micro-fiber cloths to use around the house. And I can safely say that I haven't used wipes in a long time! Also, making your own cleaning products makes a massive difference to your cleaning routine. I have a list of cleaning products that I make at home. You can see the complete list here. I know there are SO many things in our house where plastic becomes an absolute necessity but more often we tend to forgo such things. Like for example, making the switch to bamboo toothbrushes! EVERY single person uses a toothbrush. Imagine the amount of crap that goes in the dumpsters. Not just toothbrushes, q-tips as well. I can't live without cleaning my ears! I get very itchy if I don't clean them in three days. I have made the switch to wooden q-tips. I have had nightmares about plastic handle q-tips getting stuck in marine life's throats and I have woken up crying. WHAT THE HELL ARE WE DOING TO OUR PLANET? How many times have we just peeled a potato and thrown the peels in the garbage can? Throwing food scraps in the bin just contributes to a whole new level of pollution. Star composting your food scraps. You can even start composting in your small apartment. Use the compost for houseplants or just sprinkle across your lawn for a better growth. Now, recycling plastic does cause pollution to the environment but its comparatively less to the amount of pollution that manufacturing causes. Stop throwing batteries, soda cans, newspapers and other things in the bin. Start collecting them for recycling purposes. You can use newspapers to wrap gifts. Refuse to buy things that are in plastic containers. Not only does plastic harm the environment, it harms your body as well. Put everything to use when trying to create a healthy zero waste environment for you and your future generations to live in. Every single step that you take to create a zero-waste planet is related to the other so basically, even a small step that you take will bring about a big change from your side. Always remember, it takes one person to take a stand and make a change.